Children and families who must cope with serious illness are true heroes. Our group of professionals is dedicated to caring for these heroes at a point in the child’s illness that is immeasurably difficult for all involved. care, helping the child and the family live each day as fully as possible. Our goal is to achieve pain and symptom management, while respecting the family’s choices and making transitions between care settings seamless. Our family-centered approach is responsive to spiritual and emotional needs, and we work in a flexible manner as care plans change. 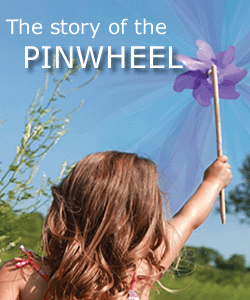 The pinwheel is our symbol for pediatric hospice. It represents the free, playful, hopeful spirit of children. The child and family are in the center, surrounded by a compassionate team that spans the spectrum of caring. We raise our pinwheels to the wind in celebration of our heroes: children and their families.